Art & Frame of Sarasota: The Perfect Gift for the Artist in Your Life! Trying to find the perfect gift for the artist in your life? There are tons of products out there and every artist has their own personal favorites, so don't stress--just get them a gift card! 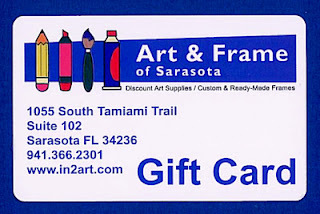 Art & Frame of Sarasota Gift Cards can be used at the store or online! And you can buy them in store or online!